PayPal Certified, Verified and a 100% product quality check. Plus... We’ll send you a free artwork proof before work begins. See why we are Australia’s leading online signs company. QuickSmart Signs is famous for genuine quality and as a reliable manufacturer and supplier of signage solutions Australia wide - Brisbane Sydney Melbourne etc. Banners, Laser Cutting, Reception signage, portable displays, expo banners, Interchangeable shipped all over Australia... Fast! New website design by the QS Team. 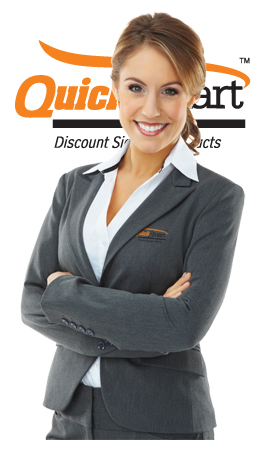 Welcome to QuickSmart Signs Australia, discount signage products and sign makers. New Postcode Shipping Estimator makes ordering and shipping your products easy! Our new website includes exciting new features for customers including an online sign supply shop where you can purchase cheap signs and banners direct factory prices. Now Also Mesh Banners New Zealand is a stunning success! Selling discount orders of printed mesh signs banners for NZ sign companies & designers. Direct from our large factory & warehouse, you can buy Supplies, Banners, advertising signs, Banners, Huge fence signs and Event Signage Contracts. See prices, compare products and call for advice or orders at anytime free. With 15 years online and over 5000 projects made, we look forward to supplying genuine quality that puts your business advertising in front... perfectly! You can buy all of the products seen on the website online, or order over the phone. PayPal Payment facilities are in place for easy-to-use and secure checkout. Place your order online now and have it delivered direct to your door. An easy to use shipping estimator is also located on each product page to help you calculate the cost of shipping. Now available direct to Melbourne, Sydney, Brisbane and Adelaide signs and lots more become easy to buy online with two deliveries everyday including Perth Hobart Darwin and Canberra. The new PayPal Certified discount sign shop by QSonline is a fantastic way to buy signs online safely and securely. Two deliveries across Australia everyday, Melbourne signs Sydney signs Brisbane Darwin Adelaide Perth Hobart Canberra and 100’s of regional towns all go to provide you with signage arriving on-time, on-budget & all from our signwriting company here in Australia. New concepts, great looking signage made, ideas and marketing concepts, our updated signwriting galleries are a great place to start. All 100% quality checked and delivered Australia wide to your door. Choose modern colors, gain ideas and look at the fantastic signs available around Australia from our sign manufacturing facility and warehouse. Melbourne Sydney Brisbane Adelaide Canberra Perth or Darwin. All regional cities and towns.